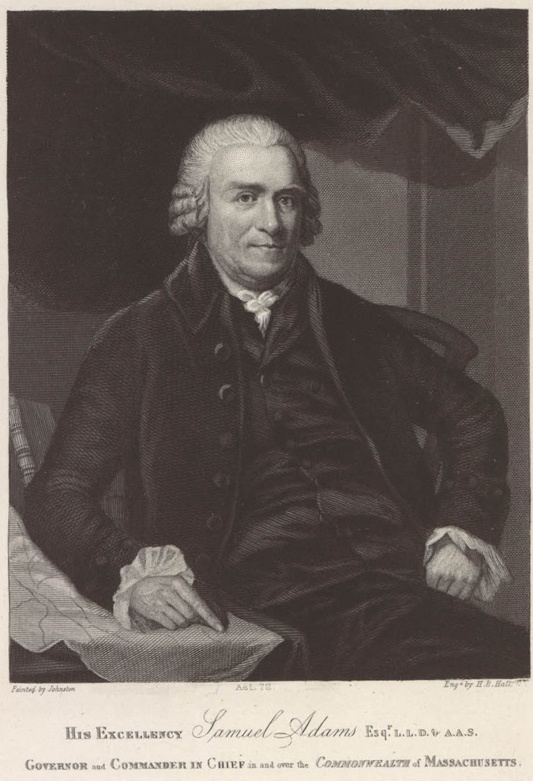 Since this is Hallowe’en, I’ll relay a story from the newspaper publisher and politician Benjamin Russell (1761-1845), who grew up in Boston before the Revolutionary War. It was a part of my duty as an assistant in the domestic affairs of the family, to have the care of the cow. One evening, after it was quite dark, I was driving the cow to her pasturage,—the common. Passing by the burial-ground, adjoining the Stone Chapel, I saw several lights that appeared to be springing from the earth, among the graves and immediately sinking again to the ground, or expiring. To my young imagination, these lights could be nothing but ghosts. I left the cow to find her way to the common, or wherever else she pleased, and ran home at my utmost speed. Having told my father the cause of my fright, as well as I was able, while in such a state of terror and agitation, he took me by the hand and led me directly to the spot, where the supposed ghosts were still leaping and playing their pranks near the surface of the ground. My hair rose on end, and seemed to lift my hat from my head. My flesh was chilled through to my very bones. I trembled so that I could scarcely walk. Still my father continued rapidly marching towards the spot that inspired me with so much terror. When lo! there was a sexton, up to his shoulders in a grave, throwing out, as he proceeded in digging, bones and fragments of rotten coffins. The phosphorus in the decaying wood, blended with the peculiar state of the atmosphere, presented the appearance that had completely unstrung my nerves, and terrified me beyond description. I was never afterwards troubled with the fear of ghosts. So nothing to worry about, kids! Just the sexton digging up old bones and glow-in-the-dark coffins to make room for new bodies. When quite a child Russell was noted for a remarkably retentive memory and more than ordinary facility in learning the tasks prescribed by his teacher. He was placed at the public school taught by Master [James] Carter, whose aptness in teaching and mildness of discipline were somewhat celebrated. Nothing was then taught in the common schools of Boston but the simplest elements of education. The tasks, that Russell had to perform, embraced nothing but easy lessons in reading, writing, and arithmetic. No science, history, geography, or other subjects. On Saturday, 4 November, Faneuil Hall will host a reenactment of the Boston town meeting I described yesterday, setting up a non-importation boycott against the Townshend duties. Meanwhile, in the surrounding marketplace volunteers will reenact an outdoor public demonstration against the royal officials who came to Boston to collect those duties. That protest took place on 5 Nov 1767. Boston 1775 readers will recognize the Fifth of November as when Boston youths enjoyed raucous processions, with giant effigies representing the British Empire’s Catholic enemies and the political scapegoats of the day. Come try your luck as a young apprentice in this colonial marketplace game. Whether you buy, barter, or smuggle, the goal’s the same: bring all your goods back to your employer and get promoted! This drop in program is best for ages 6-10, Faneuil Hall, Education Space, basement. Meet reenactors portraying Bostonians of different social classes in Samuel Adams Park, directly in front of Faneuil Hall, and learn about why they are protesting the new laws. Revolutionary Town Meeting: Stand Up! Speak Out! Join a lively meeting to debate Boston’s response to the hated Townshend Acts. Character cards are available. Free, 30 minutes, Faneuil Hall, Great Hall, second floor. Join a rowdy street protest and process around Faneuil Hall and Quincy Market to the Old State House. Dive into Boston’s Revolutionary past and explore the galleries inside the Old State House. Admission is free to all. This reenactment is being organized through Revolution 250, the coalition of local organizations commemorating the sestercentennials of events in Massachusetts leading up to the break with Britain. In this case, the sponsoring organizations are Boston National Historical Park, Minute Man National Historical Park, The Bostonian Society, and the Massachusetts Historical Society. I started pushing for this event last year, saying that Revolution 250 shouldn’t miss the anniversary of a big political event involving giant puppets. But Jim Hollister of Minute Man Park really got the wagon rolling, along with such dedicated reenactors as Niels Hobbs, Matthew Mees, Ruth Hodges, and many others. It will be a once-in-a-lifetime anniversary! In its post-Puritan way, Boston had made such official pronouncements against spending money on luxuries and “Superfluities” for a long time. Town leaders also promoted local manufacturing capability so people would spend less on cloth and other material shipped from Britain. Both campaigns dated back well before conflicts with the British government had started to grow in the mid-1760s. adhere to the late Regulation respecting Funerals, and will not use any Gloves but what are Manufactured here, nor procure any new Garments upon such an Occasion, but what shall be absolutely necessary. But there was a bigger threat at this time. The phrase “the late additional Burthens and Impositions on the Trade of the Province” referred to how Parliament had imposed tariffs on the import of tea, glass, lead, paper, and painters’ colors into the North American colonies. Those new taxes came to be known as the “Townshend duties.” So private transactions were no longer the only thing taking hard money out of Boston; the government in London was about to do so as well without Massachusetts having a say in the decision. Therefore, this town meeting went beyond issuing yet another call to do without “foreign Superfluities.” It sought to cut down on all imports from Britain as a strategy to pressure London merchants into lobbying Parliament to repeal those new tariffs. After all, that boycott strategy had worked against the Stamp Act. The meeting appointed a committee to draft terms for a boycott. Those men included many of the town’s leading merchants: John Rowe, William Greenleaf, Melatiah Bourne, Samuel Austin, Edward Payne, Edmund Quincy tertius, John Ruddock, Jonathan Williams, Joshua Henshaw, Henderson Inches, Solomon Davis, Joshua Winslow, and Thomas Cushing. Leading politicians who weren’t in trade, such as James Otis, Jr., and Samuel Adams, didn’t make the list. At this moment the merchants were steering Boston’s political course. Loaf Sugar, Cordage, Anchors, Coaches, Chaises and Carriages of all Sorts, Horse Furniture, Men and Womens Hatts, Mens and Womens Apparel ready made Houshold Furniture, Gloves, Mens and Womens Shoes, Sole-Leather, Sheathing and Deck Nails, Gold and Silver and Thread Lace of all Sorts, Gold and Silver Buttons, Wrought Plate of all Sorts, Diamond, Stone and Paste Ware, Snuff, Mustard, Clocks and Watches, Silversmiths, and Jewellers Ware, Broad Cloths that cost above 10s. per Yard, Muffs Furrs and Tippets, and all Sorts of MillenaryWare, Starch, Womens and Childrens Stays, Fire Engines, China Ware, Silk and Cotton Velvets, Gauze, Pewterers hollow Ware, Linseed Oyl, Glue, Lawns, Cambricks, Silks of all Kinds for Garments, Malt Liquors and Cheese. The committee also called on people to use glass and paper made in North America, not Britain—though the supply of either commodity manufactured in America was still very small. The Dublin Seminar is now accepting proposals for papers, presentations, tours, exhibits, and workshops on New England meetinghouses, churches, and other religious spaces of all denominations in the period 1622 through 1865. We are interested in theoretical approaches to the region’s architectural and religious history, specifically questions dealing with houses of worship as an Atlantic phenomenon; European, North American, or Caribbean building styles; design, construction, and furnishing techniques; private versus collective worship; the decline of the “parish” system; issues involving seating, legal jurisdiction, and musical events; and the influence of Anglican, Catholic, Quaker, Baptist, Unitarian, and Mormon sects. Additional subjects of interest include camp meetings, campgrounds, cemeteries, convents, and intentional communities like the Shakers. A principal focus of this conference is how communities and scholars can take advantage of new digital resources, new approaches to historical archeology, and new gateways to the region’s social, cultural, and ecclesiastical history. Simultaneously, the conference will address the continuing survival of extant structures. As these buildings’ original religious functions become less sustainable, their future is imperiled. The Seminar plans to offer a historic preservation workshop that will also examine adaptive reuses of these buildings. Many survivals have come to serve their communities as museums, libraries, town halls, schools, fire stations, granges, barns, and performing arts centers. To help place meetinghouses, churches, synagogues, and other religious spaces on track to permanent survival, the Seminar invites church groups, communities of faith, civic associations, architectural preservationists, and the general public to share their stories of successful conservation and multiple-use approaches to securing their future. The Seminar encourages papers that reflect interdisciplinary approaches and original research, especially those based on primary or underused resources such as material culture, archeological artifacts, letters and diaries, vital records, federal and state censuses, as well as newspapers, portraits, prints and photographs, business records, church records, recollections, and autobiographies, some of which have recently become available online. The Dublin Seminar committee hopes to assemble a program of approximately seventeen lectures of twenty minutes each, with related tours and workshops. There will be professional development points for public school teachers. The best papers will be printed in an upcoming volume of the seminar’s annual proceedings series. “Military Theaters” Symposium in Schenectady, 11 Nov. The American Revolution Round Table of the Hudson and Mohawk Valleys is hosting a free symposium in Schenectady, New York, on Veteran’s Day, 11 November. The symposium is on the topic of “The Military Theaters of the American Revolution” and will feature the editors and most of the contributors of the recent book on that topic. David L. Preston, Professor of History, the Citadel, opening remarks. The event will take place at the Schenectady County Community College, located at 78 Washington Avenue. Specifically, participants will gather in the lecture hall of the Stockade Building. Space is limited, so attendees must register in advance by sending an email to arrthudsonmohawkvalleys@gmail.com or by phoning 518-774-5669. Visit the website of the Fort Plain Museum for further details. The event is free, and attendees must provide their own lunch. The symposium is co-sponsored by Siena College’s McCormick School of the American Revolution, S.U.N.Y. Schenectady County Community College’s Community Archaeology Program, the PastQuest Research Group, Westholme Publishing, and Alpin Haus. The Hudson and Mohawk Valley Round Table is supported by the Fort Plain Museum, the Friends of the Saratoga Battlefield, the Mohawk Country Association, the Pundits Military Association, the Saratoga National Historical Park, the Washington County Historical Society, and the Recreated 34th Regiment of Foot. On Saturday, 4 November, the Abigail Adams Historical Society will welcome visitors for “Behind the Scenes at the Abigail Adams Birthplace,” a tour of the building with preservation carpenter Walter Beebe-Center. The Abigail Adams Historical Society concludes its year-long commemoration of the 70th anniversary of the rescue of the ca. 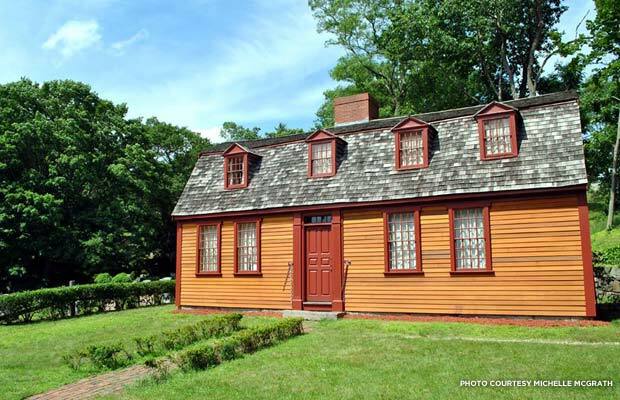 1685 Abigail Adams Birthplace from demolition with this special behind-the-scenes tour. Led by Walter Beebe-Center, owner of Essex Restoration, the program will feature an overview of the 2012–2013 restoration which Beebe-Center oversaw and which confirmed the building’s 17th-century construction date. It will also include a structural tour of the home from basement to second floor, sites usually not shown to the public. There will be two tours, the first from 10:00 A.M. to noon and the second from 2:00 to 4:00 P.M. Each tour is limited to fifteen people. Tickets are $25 per person, or $20 for members. Tickets must be reserved in advance through AAHS1947@yahoo.com. People who register will receive a reply email stating whether they have a reservation or are wait-listed. All attendees receiving a confirmation should be prepared to pay by check or cash at the door. The Abigail Adams Birthplace is at 180 Norton Street in North Weymouth. Its last day this year open for regular tours is Sunday, 12 November, from 1:00 to 4:00 P.M. Earlier this month, on 16 October, Google’s doodle of the day featured the eighteenth-century author Olaudah Equiano, as shown above. Which was great, except that the company said it was doing so to celebrate Equiano’s 272nd birthday. Many websites and Twitter feeds picked up that factoid and repeated it around the globe. But we don’t know that Equiano’s birthday was on 16 October. We don’t know what year he was born. Indeed, there’s a historical debate about whether Equiano was born in western Africa, as he stated in his memoir, or in South Carolina, as two documents from earlier in his life say. Equiano’s memoir never states the year or day of his birth, and the chronology of his early life is fuzzy. Look at his Wikipedia page, and [as of right now] it says he was born around 1745, kidnapped into slavery around the age of eleven, and sold to a particular master in 1754—so the numbers aren’t adding up. 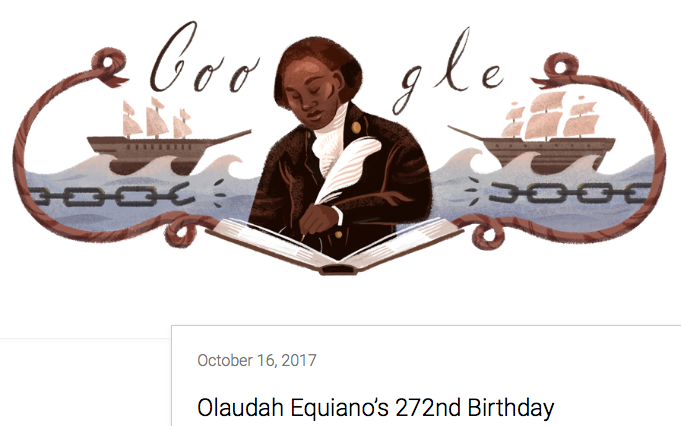 Sure, we can celebrate Equiano on 16 October, or any other arbitrary day. But to declare that’s his birthday isn’t just a claim without evidence. It normalizes Equiano’s life by modern standards when the whole point of his anti-slavery writing was that he was wrenched away from his life, family, and home. He was renamed multiple times and shipped around the globe. He had legally become property, and we don’t make a big deal about property’s birthday. Celebrating Equiano’s birthday as if we had records about his early life the way we have records about, say, Oliver Ellsworth (born 29 Apr 1745) glosses over a huge difference between those two people’s lives. Indeed, it glosses over a crime. Likewise, two days later on 18 October, a number of Twitter accounts tweeted that that date was the anniversary of Phillis Wheatley becoming free. The year they gave for that event ranged from 1773 to 1778, which should cast doubt on the dating. In fact, we don’t know when exactly the Wheatley family of Boston freed their young slave Phillis. Instead, we know that on 18 Oct 1773 she wrote a letter that described herself as having become free. So Phillis Wheatley was free by that date; she wasn’t freed on that date. That’s closer than what some other tweets have claimed about the poet—that she was born in 1753 or even on 21 Jan 1754. The sad fact is that she was kidnapped as a small child, so young as to still be losing teeth, and therefore came with no knowledge of her age and birthday. Again, we can celebrate Phillis Wheatley’s accomplishments and the fact that she won her freedom through sheer intellectual accomplishment. The 18th of October seems like an appropriate day to do that because of the evidence we have. But we don’t have clear documentation of when the Wheatley family restored her freedom, and that in itself is significant. Such an emancipation was entirely up to the owners, reflecting the slavery system. The family may have given Phillis Wheatley a document declaring her freedom, but most of her later papers vanished after she died, a reflection of her relative poverty. We shouldn’t fog over those facts about her life. This event will take place on Saturday, 10 March 2018, at Wellesley College. As southern Civil War memorials have become a flashpoint for politics and protest, it is vital that we turn the same critical gaze to New England’s public monuments. This day-long symposium will explore commemorations of people, places, and events in New England’s past, with attention to design, construction, naming/renaming, reception, preservation, destruction, and/or reconfiguration. How do these public acts of memory tell a particular story of New England? What histories might they celebrate or, whether explicitly or implicitly, conceal, devalue, or erase? How can historians recast these monumental narratives without simultaneously sweeping aside uncomfortable histories of colonialism and discrimination? We invite papers that critically examine memorials in New England from the 17th century to the present. We look for explorations of a diverse range of media including (but not limited to) sculpture, mural programs, buildings, and landscapes. Discussions of proposals for contemporary commemoration or for interventions in existing monuments should explicitly address the ways in which these activities fit into a broader historical context. Papers should be theoretical or analytical in nature rather than descriptive and take approximately 20 minutes to present. Scholars interested in presenting at this symposium should submit a 250-word proposal and a two-page c.v. via electronic mail to Martha McNamara (mmcnamar@wellesley.edu) and Barbara Mathews (bmathews@historic-deerfield.org). Proposals should include the title of the paper and the presenter’s name. The call says, “Speakers invited to present papers are expected to participate fully in the symposium program.” Which means you’re not supposed to deliver your talk and then duck out for some other event. The symposium will offer overnight accommodation for people delivering papers. 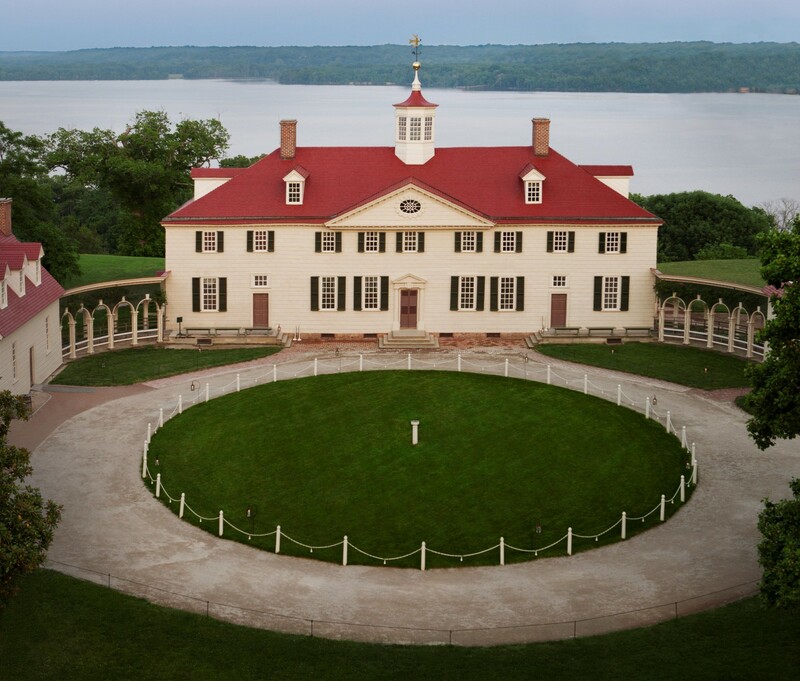 “Washington Slept Here” Symposium at Mount Vernon, 3-4 Nov.
George Washington took command of the Continental Army in Cambridge, Massachusetts in July 1775. Soon he moved into a mansion that served as his headquarters for nine months – longer than any other site until Newburgh, New York. This talk explores why the general chose that house, now a National Park Service site; how he used it; and what he learned about leading the Continental cause while inside those walls. It will also discuss how later owners – the poet Henry Wadsworth Longfellow and his family – helped to preserve the public memory of the Revolution and Mount Vernon in particular. This is, of course, quite an honor. It grows out of a historic resource study I wrote a few years back for the National Park Service. I’ll try to speak about the Longfellow House–Washington’s Headquarters National Historic Site as enthusiastically as the N.P.S. staff there does. Registration for the 2017 Washington Symposium is available starting here. “Colonial Boston’s Public Schools” at Old North, 1 Nov.
Colonial Boston took pride in its free public schools, which educated young Benjamin Franklin, Samuel Adams, John Hancock, Paul Revere, and thousands of other boys before the Revolution. But a close look at those five grammar and writing schools reveals that they provided only limited opportunities for middling-sort boys, not to mention no place for girls or non-white boys. Colonial Boston’s schools thus reflected and reinforced the town’s social and economic divisions. 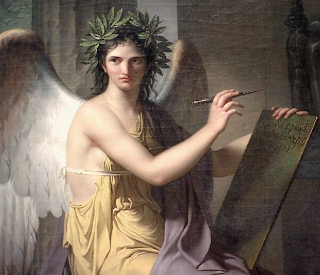 The creation of a new nation spurred major reforms in 1789, eventually leading toward today’s public education. This talk is based on research I’ve presented at different scholarly conferences, most of which will appear in an upcoming volume from the Dublin Seminar on New England Folklife. I started to look into Boston’s public schools to understand how the town’s pre-Revolutionary children spent their days. That effort soon forced me to give up a lot of assumptions I’d had about those schools, such as what they taught—they didn’t cover reading and writing, history, geography, science, or other standard modern topics. Likewise, I had to discard idea about who went to those schools—only about half of the eligible white boys. And about how long those scholars lasted—two-thirds of more of the seven-year-olds entering the South Latin School taught by John Lovell (shown above) dropped out before finishing. Thus, while Boston can pride itself on having the oldest public school system in the U.S. of A., legally open from the start to (white male) students from all classes, that pre-Revolutionary system didn’t provide equal opportunity as we might think. In 1789 the town had its first major debate on school reform since adding writing schools to the grammar or Latin school—reform explicitly driven by new republican ideas. This talk is scheduled to start at 6:00 P.M. Register for the program here; the price is a “pay what you will” donation to the Old North Foundation. What is the role of historical organizations in a politically polarized environment, a world of “alternative facts” and a social fabric that is being torn apart by political and class divides? Many historians and public historical organizations are changing the way they work, offering their talents and skills as advocates and healers. Yet, they face a complex public. Some audience members embrace the opportunity to engage in dialogue over difficult issues. Others seek a more entertaining, escapist experience. Still others are alert to activities that appear to overstep the traditional role of museums or to signal that their own perspectives might be unwelcome. Some visitors yearn for the inclusion of minority viewpoints but consider museums too inherently biased to present these narratives. It is all a challenging prospect for organizations that are seeking to be truly inclusive and build broad public support. Join us for a compelling conversation. There is a $10 registration fee for this discussion, but it’s waived for all “Historical Colleagues” working or studying in the field. The event begins at 5:30 P.M. with a reception. The discussion is scheduled to last from 6:00 to 7:30. In looking at accounts of John Hancock’s funeral in 1793, I was surprised at the praise that newspaper writers heaped on him. Today we think of Hancock as a lightweight compared to the Adams cousins, the Virginians, and most other Revolutionary politicians who remain household names. But those laudatory essays show how his contemporaries—at least some of them—esteemed the man. To record, with precision, the virtues of his mind—the philanthropy of his heart—his patriotism, or his usefulness, were to insult the judgment of every American. If we ascend into the Senate of the Union, we there find his name first on that MAGNA CHARTA, which ascertained, vindicated, and declared the Independence of AMERICA—and the repeated suffrages of his fellow-citizens to sustain the important office of First Magistrate of this Commonwealth, shew how highly he was esteemed as capable to guard their rights in the Cabinet of Massachusetts. If we search our Municipal Records, we shall see him sustaining with honour the most important and arduous stations. Look we into the Temples dedicated to the Most High, we shall there view numerous marks of charity and benevolence. But if we explore the hearts of the indigent and distressed—the Widow—and the Orphan—we shall see those lively emotions—which emphatically say,—our friend and our supporter is gone. we are bound in duty to remark that upon his Excellency’s assumption of the supreme command, he bent every effort of a philanthropic mind to close the wounds of a bleeding republic; and instantly smoothed the rough waves of opposition. Indeed, he was the Trajan of America, who counted every day lost that was not marked by active goodness, and thousands of his momentarily deluded fellow citizens in the western countries, dwell with transport on his name.—Hancock and humanity are synonymous. Of an immense fortune, he has made the noblest sacrifices. Seminaries dedicated to Science, Temples inscribed to Religion, bear honorable witness to his munificence. Our Gallic brethren were distinguished by the polite attentions at the expence of decreasing affluence; and many individuals, who seized the opportunity of a fluctuating currency, to pay hard money bonds, have effected their dishonest purposes, at the loss of thousand to this patriotic Magistrate, who nobly resolved to support the credit of his country, tho’ he sank every farthing of his own patrimony. 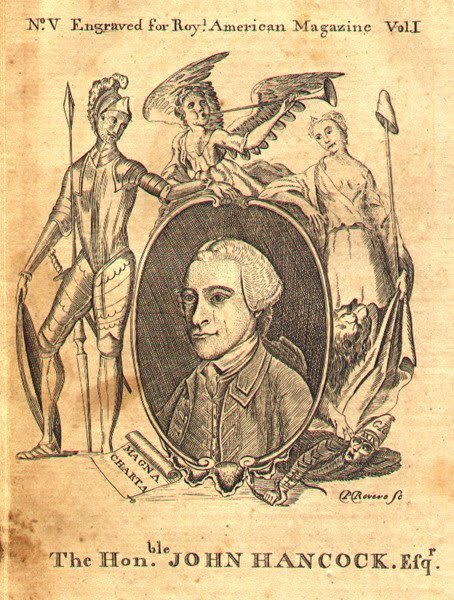 The suavity of his manners, and the politeness of his deportment, portrayed him the Gentleman; the classic purity and chaste elegance of his language announced him the Scholar; and the undeviating stability of his principles, the charity of his heart, and the beneficence of his hand, marked him the Man of Virtue. He was the Patriot [that’s probably supposed to be“Patron”] of Literature; and the records of our university have ranked the name of Hancock among the foremost of her generous donors. . . .
All three of those newspapers supported the Washington administration, and the Federalist press was more rapturous than the opposition press. Hancock wasn’t really part of either nascent national party, though. He steered for whatever policy kept his voters happy and himself elected. He came out for the new U.S. Constitution only at the last stage of the state’s ratification debate, and after that he worked hard to uphold the standing of states—especially Massachusetts and especially its governor. Here are some additional details from Gov. John Hancock’s funeral on 14 Oct 1793. It was scarcely possible for the aids who accompanied him, to support his debilitated frame, till he reached Perez Morton’s, Esquire. Adams was seventy-one years old, born fifteen years before Hancock. The funeral procession started at Hancock’s house, near where the Massachusetts State House now stands, went south along the Common, turned east at Frog Lane (Boylston Street), turned north onto the main street through town (now Washington Street), went up to the Old State House, then west on Court Street, and finally south again to the Granary Burying Ground. Adams made it nearly all the way. Perez Morton lived in the house his wife Sarah had inherited from her Apthorp ancestors at the end of Court Street where the land starts to rise toward Beacon Hill. Adams ran for the governor’s seat himself in 1794 and held it until he retired in 1797. During the last years of his life, his essential tremor worsened so that he couldn’t write—ironic given that his political activism was based on writing. Adams outlived Hancock by ten years, dying in October 1803. Among the individual marks of respect paid to the memory of our deceased Governour, that of Mr. Duggan, near the market, arrested the attention of our correspondent. The finely finished sign of his excellency which is suspended from his house, was covered with a mourning crape; and exhibited a very decent tribute of regard and gratitude. 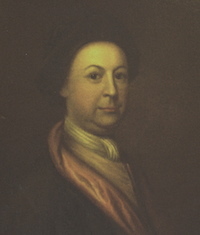 John and Mary Duggan had opened the Hancock Tavern on Corn Court in 1790. Mary Duggan had inherited the house from her family, the Keefes or Keiths. She deeded the property to her husband in early 1796 and died soon afterwards. He then married another woman named Mary (there were a lot of those, to be fair), had three children with her, and died in 1802. The late and venerable American Statesman and Philosopher, Dr. BENJAMIN FRANKLIN, sitting at a Table, with an Electrical Apparatus. JOHN HANCOCK, Esq. Present Governor of Massachusetts, and ALEXANDER HAMILTON, Esq. Secretary of the Treasury of the United States, at a Table, and the Figures of Peace and Plenty advancing to crown them with wreaths of Laurel. It’s striking that of all the politicians living in America at that time, Hancock and Hamilton were the two featured in this display. But Bowen rotated figures to bring customers back; he’d already advertised President Washington earlier in the year. In addition, he was in the process of moving his operations from New York to Boston, and Hancock would be a big draw in his new home. At sunrise on Monday, 14 Oct 1793, all the church bells in Boston began to ring. They tolled for an hour in tribute to Gov. John Hancock, who had died the previous Tuesday and was being buried that day. All the flags “in town, at the Castle, and on the masts of the shipping in the harbour, were half hoisted.” At one o’clock, all the shops closed. All morning local militia units, both official and independent, were gathering in the town. Everyone knew that Hancock, colonel of the Cadets before the war, loved military pomp. Company of horse (from Middlesex) under Capt. Fuller, who commanded the horse. 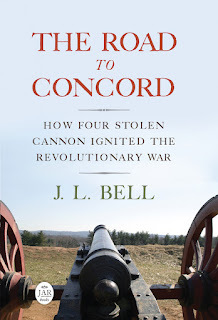 That cannon is one of those at the center of my book, The Road to Concord. The same gun is now on display at the North Bridge Visitor Center of Minute Man National Historical Park, with no black velvet. The first battalion of infantry, Composed of the Boston Regiment, in complete uniform, commanded by Col. [William] Schollay; and led by Lt. Col. Wood. Music of the 1st battalion. Independent Cadets, under Major Elliot. Brigadier General [William] Hull, Commanded the whole of the military parade. Col. [John Steele] Tyler, Marshal of the unarmed procession preceding the Corpse. Platoon, and field-officers, of the third division of Militia. Major Gen. [John] Brooks, of the third division. Platoon and field officers of the second division. Platoon and field-officers of the first division. Major General [Henry] Jackson and aids. His Honour the Lt. Governor [Samuel Adams]. Hon. Mr. [Azor] Orne, Hon. Mr. [Moses] Gill. Col. [Josiah] Waters, marshal of the procession, following the corpse. Vice-President of the U. States [John Adams]. Members of the Hon. Senate, and House of Representatives of the U. States. The Foot closed by Captains of vessels, and seamen, with flags furled. As the procession moved through town, a cannon was fired every minute from Castle Island and a squad of the artillery militia stationed on Beacon Hill. After Hancock’s corpse was interred at the Granary Burying Ground, the troops under arms fired three times. The Orphan’s father, and the widows’ friend. HANCOCK!—The name alone with time shall end. The “Commander in Chief” who called off that militia muster was the new acting governor, Samuel Adams. After bumping heads during and after the war, the two pre-Revolutionary colleagues had allied on a political ticket in 1787. Bostonians were thus all excited for a big militia parade when they heard about Hancock’s death, and then they had to go home. I suspect that was an additional reason for the big turnout at his funeral six days later. If they couldn’t march one week, then they could march the next. 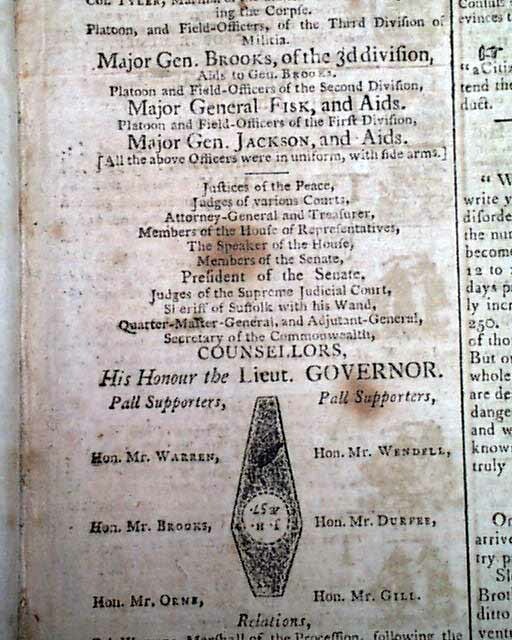 At a legal Meeting of the Inhabitants of this Town on Friday last, to take into consideration the measures proper to be taken by them, for attending the Funeral of His Excellency JOHN HANCOCK, that every mark of respect may be paid by his fellow-citizens to the remains of so illustrious a Patriot and Friend to Mankind; the following Votes passed unanimously, viz. Voted, That it be recommended to the Inhabitants, that they shut their Stores and Shops, at One o’Clock, P.M. on Monday next, and continue the same shut until the Funeral Solemnities shall be performed. Voted, That the Selectmen be requested to cause the Carriages, Trucks, and other Obstructions, to be removed from State Street and other Streets where the Procession may be on Monday Afternoon. That was as close to declaring an official holiday as a town of that time could do. In his 2000 biography of Hancock, Harlow Unger wrote that Gov. Adams declared the day of the funeral to be a holiday, and other books have repeated that statement since. I don’t see any evidence for that, however. A gubernatorial proclamation would have been an official, widely published document—like the Thanksgiving proclamation that ran in the 9 October Columbian Centinel. (That announcement, dated 28 September, was still in Hancock’s name.) So I don’t think Hancock’s funeral day was an official state holiday. TOMORROW: But no work got done that day. John Hancock was in poor health for the last decade of his life. Political opponents, and even some friends, muttered that he exaggerated his medical problems to get out of difficult situations. The most famous example of that was when he lost a war of wills with President George Washington in 1789 over which man would call on the other, thus implying political inferiority. Hancock had himself carried in to meet the President with bandages on his legs to excuse his not coming earlier. Hancock also pled illness in stepping down from the governorship in 1785, shortly before the economic crisis that led to the Shays Rebellion came to a head, and in keeping quiet on the proposed new Constitution for as long as he could in 1788. But Gov. Hancock did have health problems, and they prevented him from doing not only what he didn’t like but what he liked. On 18 Sept 1793 he prepared a speech to the Massachusetts General Court about a landmark legal case (which I’ll get to later). But he was too weak to deliver it, and had to watch the secretary of the commonwealth, John Avery, read it instead. Hancock died less than a month later on 8 Oct 1793, aged fifty-six. A letter relaying that news to New York said, “Governor HANCOCK died this morning; his death was unexpected, although he has been indisposed for some time past.” People had gotten so used to the governor being ill that no one expected him to actually die. On the morning of his death, he expressed no unusual complaints, till about seven o’clock, when he suddenly felt a difficulty in breathing; his physicians were immediately sent for, who gave him some temporary relief, but the dissolution of nature made such rapid progress, than before eight o’clock, he resigned his soul into the hands of HIM who gave it. TOMORROW: How Boston heard the news. Earlier in the week I wrote about the funeral of Christopher Seider. The merchant John Rowe stated in his diary, “I am very sure two thousand people attended his Funerall.” That would have been one of every eight people in Boston. a vast Number of Boys walked before the Coffin, a vast Number of Women and Men after it, and a Number of Carriages. My Eyes never beheld such a funeral. The Procession extended further than can be well imagined. But within a couple of weeks came the funeral of the first four victims of the Boston Massacre, and that was even bigger. “Such a Concourse of People I never saw before—I believe Ten or Twelve thousand,” wrote Rowe. That was more than twice the reported capacity of Old South Meeting-house. It is supposed that there must have been a greater Number of People from Town and Country at the Funeral of those who were massacred by the Soldiers, than were ever together on this Continent on any Occasion. However, back in 1740 Boston newspapers estimated that on several days the Rev. George Whitefield had preached to crowds of 15,000 to 23,000 people on Boston Common. The siege of Fort Carillion in 1759 also involved more than 20,000 people. The main reason for that turnout was fond feelings for Hancock. Most people in Massachusetts admired their governor. Many authors have written that Hancock accomplished little in his final years, but that assumes he went into politics to make changes. 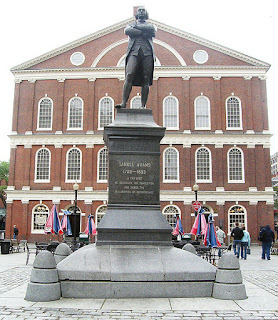 Once independence was achieved, and perhaps even before, I think Hancock’s main aim was to increase and preserve his own popularity by keeping most people happy, and in Massachusetts he achieved that. Another reason for the big occasion on 14 Oct 1793, I think, arose from the circumstance of Hancock’s death on 8 October. TOMORROW: How the governor died. On Saturday, 14 October, the Westborough Rotary Club and the Westborough Historical Society will present a re-creation of a town militia muster. Specifically, this event commemorates the 243rd anniversary of the Westborough militia’s September 1774 march to Worcester to help close the county court in protest of the Massachusetts Government Act. Reenactors portraying Westborough militiamen will perform the manual of arms, the standard military drill from 1774. There will be musket-firing demonstrations throughout the day. A colonial market will display a variety of colonial trades and crafts while citizens of Westborough will make items for barter or sale to the assembled militiamen. Westborough’s own Rev. Ebenezer Parkman will harangue and inform the crowds. There will also be food trucks and vendors for attendees, displays of artifacts and documents, and eighteenth-century children’s games. This event is scheduled to take place from 10:00 A.M. to 4:30 P.M. in Veteran’s Freedom Park, 169A West Main Street. See the town library’s collection of Revolutionary documents here through Digital Commonwealth. Parkman’s diaries have been published, with some pieces freely available and others only in print. We can assure the Publick, that a Monument will be erected over the Grave of young Snider, with an Inscription, to perpetuate his Memory; A Number of patriotic Gentlemen having generously subscrib’d for that Purpose——It is said it will be done in an elegant Simplicity, and that the Overplus Money, if any, will be given to the Parents. That presents a political mystery. The “Gentleman who had a considerable share in the popular transactions of the year past” had to be one of Boston’s Whigs. But Sewall was a friend and vocal supporter of the royal government. Would the same newspaper writer attack both sides? So who was the “Gentleman who had a considerable share in the popular transactions of the year past”? I think the most likely candidate is William Molineux. He was definitely the Whigs’ leader in street demonstrations. He was close to Madam Grizzell Apthorp, who had employed Christopher Seider as a house servant, and he was on the scene when people arrested Richardson. Molineux was also in need of money. On 1 May 1771 he was supposed to repay the town of Boston £300 it had loaned him to kickstart a cloth-weaving enterprise that would employ the poor. He never did pay that back. 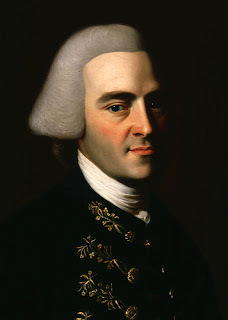 By 1774 Molineux had probably applied money he was supposed to manage for Charles Ward Apthorp of New York to the weaving scheme. So it’s not hard to imagine that the funds collected for a monument to Christopher Seider went into the same hole. Then again, the first report from 1770 said merely that some gentlemen had “generously subscrib’d” or promised money for a monument. The Trifler may have been wrong to say that funds had actually been collected. After all, in the evening after the Gazette reported on the possibility of a monument, the Boston Massacre took place. Suddenly everyone had something new to focus on and argue about. Yesterday I started to look into the question of whether Christopher Seider, memorialized on a stone in the Granary Burying-ground, was actually buried there in 1770. 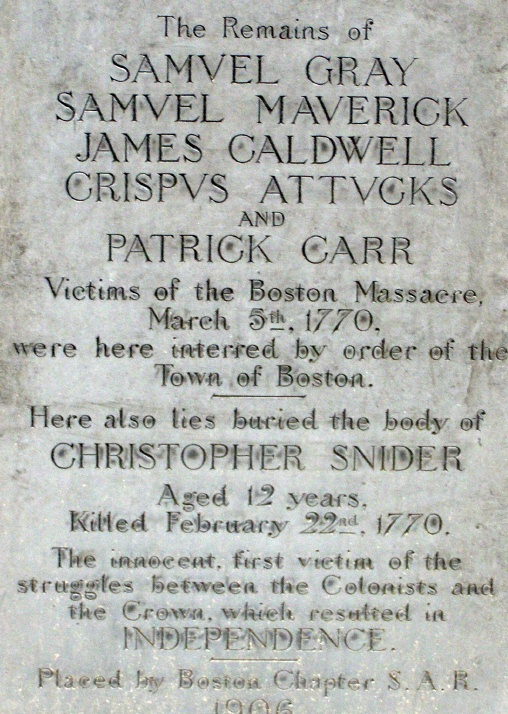 Christopher Snider, 1st Martyr to the Noble Cause, was likely buried at Central Burying Ground, and not at Granary as commemorated. A grand funeral was, however, judged very proper for him. Young and old, some of all ranks and orders, attended in a solemn procession from liberty tree to the town-house, and then to the common burying ground. The Seider family lived near the south end of Boston Common on Frog Lane (now Boylston Street). So it might make sense to place his body in the cemetery nearest their house—what we now call the Central Burying Ground (shown above, courtesy of Wikipedia). The problem with that analysis is that the phrase “common burying ground” didn’t rule out the Granary Burying Ground because that, too, had been carved from land originally assigned to Boston Common. Nathaniel B. Shurtleff’s A Topographical and Historical Description of Boston confirms that the cemetery beside the Granary was sometimes called by the Common Burying Ground. Hutchinson might also have used the word “common” to mean not the Boston Common but the tombs and graveyard space that Boston owned collectively. Likewise, at different times Bostonians referred to both the Granary Burying Ground and the Central Burying Ground as the South Burying Ground and as the Central or Middle Burying Ground. As more cemeteries were opened to the south, the labels shifted. In 1770 the middle cemetery was the one beside the town granary. His Remains were attended on Saturday last from Faneuil-Hall by a numerous and respectable Train of Mourners, to the same Grave, in which those who fell by the same Hands of Violence were interred the last Week. After young Christopher Seider was killed on 22 Feb 1770, where was he buried? A marker in the Granary Burying Ground (shown here) bears his name under those of the five people who died the following month after the Boston Massacre. But that’s not a contemporaneous marker. It was erected by the Sons of the American Revolution in 1906. The Remains of young Snider, the unfortunate Boy who was barbarously murdered the 22d of February last, was decently interred the Monday following. His tragical Death and the peculiar Circumstances attending had touched the Breasts of all with the tenderest Sympathy, a few only excepted, who have long shown themselves void of the Feelings of Humanity. The little Corps was set down under the Tree of Liberty, from whence the Procession began. About Five Hundred School boys preceded; and a very numerous Train of Citizens followed, in the Estimation of good Judges, at least Two Thousand of all Ranks, amidst a Crowd of Spectators, who discovered in their Countenances the evident marks of true Sorrow. I disagree with Kachun’s reading. The report mentions “the Tree of Liberty” as the start of the funeral procession, not the end. To be sure, this article didn’t state where the boy’s body ended up. But under Liberty Tree would have been a very unorthodox spot, likely to be clearly mentioned in other sources. Despite that elm’s public symbolism, it wasn’t on public land; it was in the yard of bookbinder John Eliot. No later description of the tree mentioned that it was also a gravesite. Furthermore, the tree was on a well-traveled corner. There was a old British custom of burying people who had committed suicide at such crossroads instead of in designated graveyards; Parliament finally outlawed that practice in the reign of George IV. In 1770 Boston’s Whigs wanted to present Christopher Seider as an innocent young martyr to liberty, and burying him on unconsecrated land at a crossroads would have undercut that message. TOMORROW: So if Christopher Seider was interred in a burying-ground, which one? 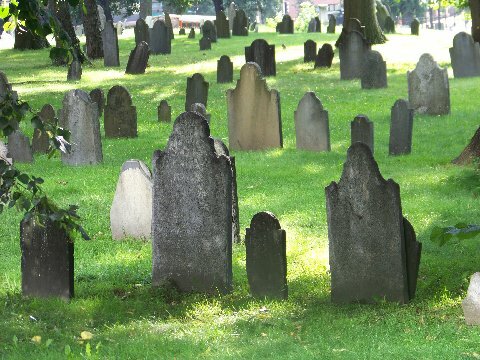 As part of Massachusetts Archaeology Month, the New England Historical Genealogical Society is hosting a free lecture on 11 October by Ta Mara Conde, founder of Historic Gravestone Services. Burial grounds are outdoor museum: accessible and open to all. The stones reveal the history of the town and its people. Join Ta Mara Conde, a monument conservator with Historic Gravestone Services, for a visual tour of America through its early burial grounds. Discover the meaning behind symbols adorning historic gravestones, understand society’s changing attitudes toward death, and learn about the geology found in your local burial ground. Unearth the stories hidden in the stones. Conde began restoring historic gravestones in 1998 as an apprentice to Fred Oakly, head of conservation for the Association of Gravestone Studies. 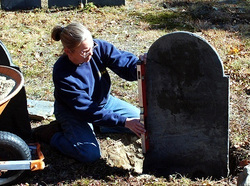 She provides professional restoration services for grave markers, monuments, sculpture, and other stone works using historically accurate materials and standard conservation techniques. Ta Mara studied with the National Park Service and Cathedral Stone Products Certification Program, and has taught conservation workshops through Greenfield Community College and private organizations. This event is scheduled to start at 6:00 P.M. on Wednesday, 11 October, in the N.E.H.G.S. building at 99-101 Newbury Street, Boston. Register for a seat here. The Museum of the American Revolution Hosts a Film Premiere, 9 Oct. In August I visited the Museum of the American Revolution in Philadelphia, which opened to great fanfare earlier this year. 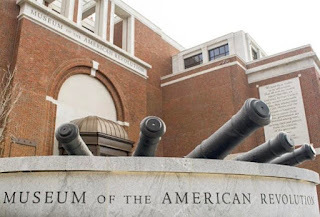 Like the American Revolution Museum at Yorktown, which I wrote about here, the Philadelphia museum combines the historical artifacts of an older, traditional collection with new technology. For the M.O.A.R., the parent institution was the Valley Forge Historical Society. The museum also inherited the site of a visitor center built for the Bicentennial, close to Independence Hall and other historic sites in old Philadelphia. Like the Yorktown museum, it pays particular attention to the events that happened in the region. It thus offers the best treatment of the Trenton and Princeton maneuvers that I’ve seen as well as some about Brandywine, which didn’t turn out so well for the Continentals. But the M.O.A.R. aims to tell the full story of the Revolution, starting with the 1763 Treaty of Paris, the political disputes of the late 1760s and early 1770s, and the campaigns all over eastern North America. The exhibit designers took pains to include the perspectives and choices of poor men and women, African-Americans free and enslaved, sailors, and other people not always included in the narrative. It becomes hagiographic, I thought, only in the final exhibit, the unveiling of Gen. George Washington’s campaign tent. And that really is a neat artifact. One hallmark of the M.O.A.R. are life-size figures recreating dramatic moments, such as Israel Trask’s memory of the snowball fight in Harvard Yard, the tearing down of George III’s statue in New York in July 1776, and a charge by Col. Banastre Tarleton’s horsemen. But there are also plenty of electronic interactive exhibits and genuine artifacts to intrigue all sorts of visitors. I felt some special jolts of recognition. Some folks in the films and dioramas looked quite like reenactors I’ve had the pleasure of meeting. The introductory film shows the “No Taxation without Representation” phrase printed as I wrote about it here. And the museum has a large portrait of Capt. William Crosbie, the likely owner of the pistols captured at Lexington that I wrote about here. The M.O.A.R. has a gallery dedicated to explaining the Oneida contribution to the Continental cause. The Oneida Indian Nation was also one of the institution’s major benefactors. That space may feel out of proportion to the influence the Oneida had on the war, but it serves as a metonymy for all the Native American groups on both sides, for whom the War for Independence proved terribly significant. Tomorrow, in commemoration of Columbus Day/Indigenous Peoples’ Day, the museum will host the first showing of “People of the Standing Stone,” a film about the Oneida nation in American history. Directed by Ric Burns and narrated by Kevin Costner, the 25-minute film explores the Oneida alliance with the Continental Congress and what followed in the early republic—the unjust appropriation of much of the nation’s land. This weekend, ahead of the movie, Darren Bonaparte of the Mohawk community at Ahkwesáhsne is performing in the museum’s Patriots Gallery. On Monday at 11:00 A.M. and 2:00 P.M. dancers from the Oneida Indian Nation will perform traditional Haudenosaunee social dances there. Kevin Gover, Director of the National Museum of the American Indian in Washington, D.C.
Tickets to the special screening and discussion are $15 for general admission, or $5 for Museum members and students.